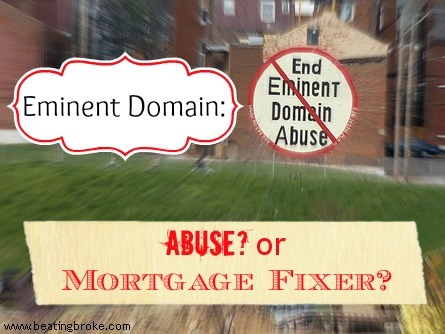 Eminent Domain as a Mortgage Fixer? The housing crash of 2008 is still sitting heavy on many homeowners. Many who bought a house during the peak of the market were left with houses that they’d bought at nearly twice the current value of the home. Much has been said about the dilemma that those homeowners find themselves in. As the economy receded, so too did their jobs, and their pay, causing many to simply walk away from their homes when they could no longer afford the mortgage. Foreclosure is a bit of a messy deal. The bank takes the home back, and then sells it, attempting to recoup some of the value of the mortgage. We’ve seen many different methods of attempting to avoid the bulk foreclosure of homes in America. From Government sponsored programs that help with restructuring of the loan, to banks voluntarily restructuring the loan, to what is a rather disturbing new program in Richmond, CA. The program is laid out in this recent article on CNN Money. (California city’s drastic foreclosure remedy: seizure) In the article, the City has started a program to attempt to purchase the mortgages of many underwater loans in the city. It’s an attempt to avoid the decline of low-income neighborhoods, and those neighborhoods already hit hard by the economy. Seems pretty normal, until you read a bit further. But if the holders of the loans, who are mostly investors, refuse to sell by Aug. 14, the city said it will invoke eminent domain to seize the mortgages so it has more control over the process of making them affordable. That’s right. If the investors refuse to sell by August 14th, the city will invoke eminent domain and seize the mortgages in order to bring those mortgages into the program. There are several things at play here. I don’t argue that there are many who are nearing foreclosure, and that in many cases, they were preyed upon by the banks and investors by being given loans for houses they couldn’t afford in the first place. I don’t think that excuses the buyers from not knowing that they couldn’t afford the mortgage. I’m sure there are those that could afford the house at the time of purchase, but have since fallen on hard times. In some cases, I do think that there should be something in place to help people ease the pain of their mortgage. But, that’s another article. Back to Richmond, CA, and their silly new program. They plan on using eminent domain to seize the mortgage. As is pointed out in the CNN Money article, eminent domain is usually used by public entities to seize physical properties to make way for public parks, malls, and right-of-ways for transportation initiatives. The article alludes to the fact that eminent domain, to be legal, must be used for that are in the public interest. Meaning that the people of the city (or neighborhood) must have something to gain from the seizure. I think this is a bit of a grey area, and is likely to end up in court. It’s legality, in the seizure of only certain mortgages, and not the mortgages of the entire neighborhood, makes its usage for the public interest somewhat shaky. After all, who among us wouldn’t want to participate in a program that cut our mortgage in half and reduced the payments by the same? Absolutely! But, who among us has anything to gain by having our neighbor across the street participate in the program, and not us? Yeah. Even if I can afford my mortgage, I’d be a bit jealous. If I really wanted to cause a scene, I’d sue the city. Legality aside, I still think the program is a mistake. Many places around the country are facing the same dilemma, and many are trying to find innovative solutions to fix the problem. The city of Detroit just declared bankruptcy because the population of the city, and thus it’s tax-base, has dropped so drastically over recent years. Perhaps the city of Richmond fears the same problem. What they should be spending their time fixing, however, is their local economy. They’ll spend all kinds of money executing this program, then defending it in court, only to still have the same economy. If they can find ways to improve the economy by pushing local businesses, promoting local producers, and making improvements to the structures to do so, I think they’ll find that many of those foreclosures start getting picked up by new homeowners. Maybe I’m wrong. I’m certainly not an expert in economics, least of all economics in California. What do you think? Is the usage of eminent domain here a valid one? Will it be challenged legally? How would you feel if your city had a program like this? I had originally planned on taking today off from posting for Columbus Day. But, then, I thought, what the heck. It’s a day that we celebrate explorers. Columbus in particular, but exploration in general, as well. There aren’t many explorers on a global scale anymore. After all, it’s not like you can jump in a boat and go find new continents, right? Even back in Columbus’ day, money went along. Whether it was as a good luck piece, or just in case they came up on a 7-11 in the new world, they had money with. Today’s explorers have to go a little bit farther afield in order to discover something new, but even so, there’s still a little money that goes along. And I’m not just talking about the Billions that are spent to do the exploring. There’s actual money in space! Take for example, the newest exploration endeavor, the Mars Curiosity Rover. Back in August, the folks at the NASA JPL labs in California managed to drop the Curiosity, a small car sized rover, onto the surface of Mars. If you stayed up late enough (or got up early enough, I suppose) that night, you were treated to live video of the command center at JPL. It was pretty awe-inspiring. Since then, they’ve been running all kinds of tests, and sending back some pretty incredible images of the surface of Mars. Part of the rover is it’s ability to send such awesome pictures. And part of that ability is the ability to calibrate it’s cameras. The calibration panel that it uses has some interesting bits for calibration of color and detail, but also something added for basic scale. That item? A 1909 Lincoln VBD Penny. Much like the one in the image, here. Why a penny? The MAHLI calibration target includes a penny at the center of this image, plus color chips, a metric standardized bar graphic, and (just below the penny) a stair-step pattern for depth calibration. The coin is from 1909. 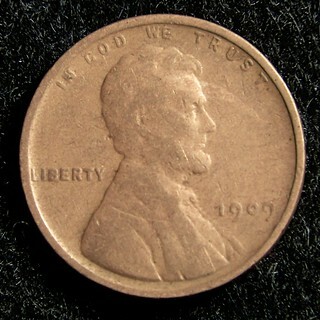 That was the first year Lincoln pennies were minted and the centennial of Abraham Lincoln’s birth. The penny is a nod to field geologists’ informal practice of placing a coin as a size reference in close-up photographs of rocks, and it gives the public a familiar object for perceiving size on Mars easily. Pretty cool, huh? Money is everywhere! Even in space! Bank Makes an Error in Your Favor – What Do You Do? This article on CNN caught my eye the other day. It’s about an “Accidental Millionaire” who discovered that a keying error by his bank resulted in him having a $10,000,000 line of credit instead of a $100,000 line of credit. Instead of notifying the bank of the error, he withdrew 6.8 Million of it, disbursed the money into overseas accounts and then promptly fled the country. About 2 and a half years later, he was caught and brought back to New Zealand to stand trial for his theft. The whole thing brings up an interesting question though. Obviously, the right thing to do would be to notify the bank of the error, so that it could be fixed and all could continue on their way. And, I think it’s fair to say, most of us would do just that. But, what if it was for such a high amount of money? Sure, if the bank makes a $10,000 error, you’ll let them know. But, what if they make a $10,000,000 error? Just how tempting would it be to do just like this guy did, take the money out and put it into overseas accounts where it couldn’t be recovered by the bank, and make a run for it? Even if you knew you could make it 2.5 years before getting caught, would it be worth it to live like a multi-millionaire for that amount of time? I think that the penalty would likely be high, and will likely involve some jail time, but would all that be worth living the rich life for a few years? I can’t see where it would be for me, personally. But, obviously, for this guy, the answer was that it would be worth it. Or, maybe he truly thought he could get away and not get caught. I’m not sure how one really thinks that they’ll be able to get away with something like that. But, he obviously did, or at least thought the trade off was worth the possible penalty. Me, I’ll settle for making my money the old fashioned way, and making it work for me. The trade-off of not making it as fast as he did, but staying out of jail is well worth it. What are your thoughts on that. 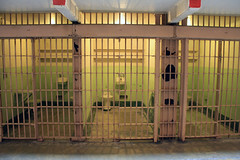 Would you trade a few years of living as a millionaire on the run be worth the possible penalties?